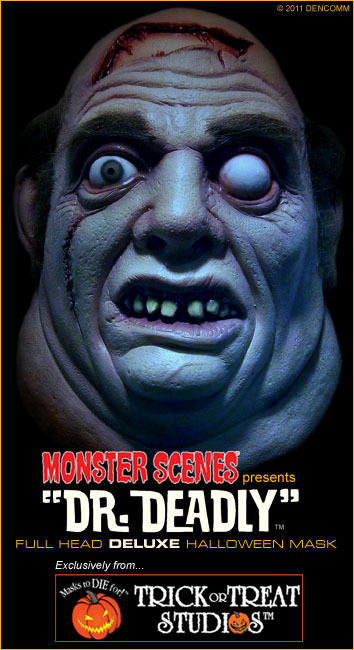 Halloween comes early – first look at the new Monster Scenes Dr. Deadly mask! 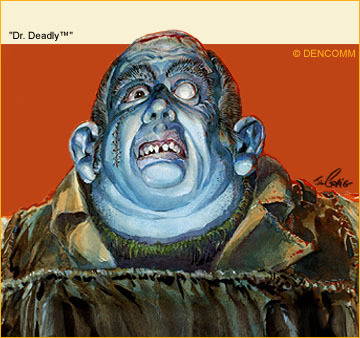 It’s the treat you’ve been waiting for – the first ever officially-licensed Dr. Deadly™ deluxe Halloween mask! First announced in 2010, this is a breakthrough for your favorite Monster Scenes cretin. 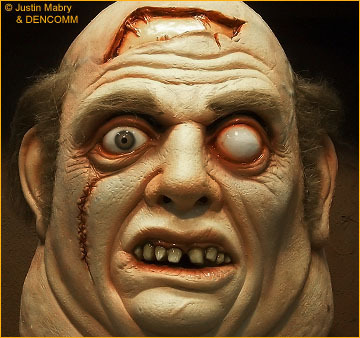 Inspired by the artwork of Jim Craig, here’s a stunning new rendering of Dr. Deadly – full scale, face to face. 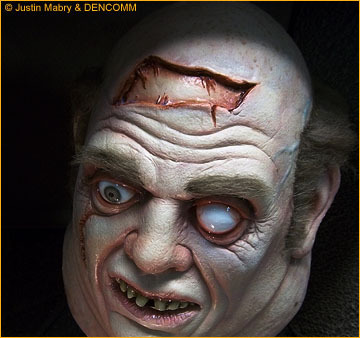 Sculpted by the remarkably talented Justin Mabry, Art Director at Trick or Treat Studios and chief ghoul at NightOwlProductions, this Dr. Deadly mask brings you closer than you’ve ever been (or might have ever wanted to be) to the medical miscreant of the Monster Scenes realm. The mask has been unveiled at this year’s Halloween & Party Expo, the annual industry gathering that’s currently underway in Houston, TX at the time of this blog entry. We at Monster Scenes extend our special thanks to sculptor Justin Mabry and Trick or Treat Studios president, Chris Zephro, for making this mask a reality. Plus, you can pre-order your Dr. Deadly mask now. Just click on over to TrickorTreatStudios.com to reserve yours today. 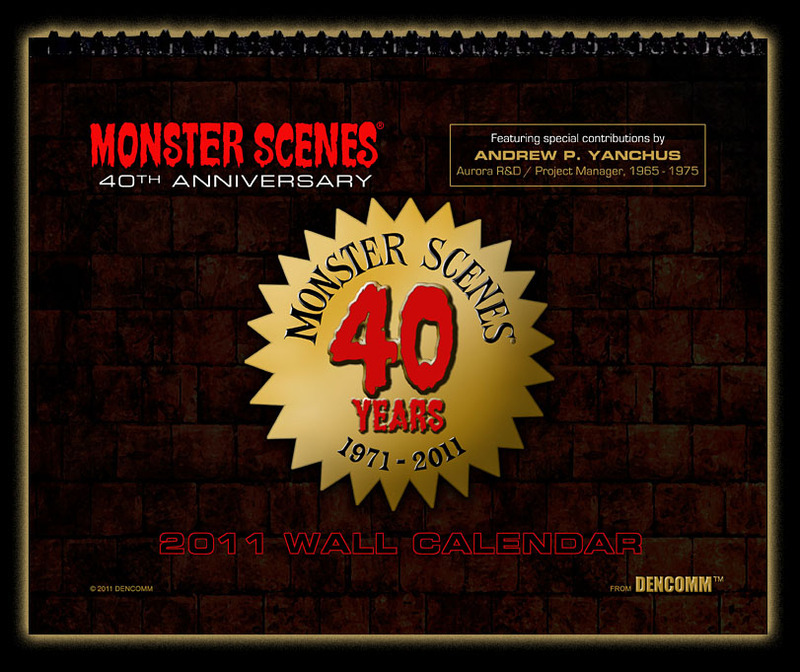 The 2011 Monster Scenes Wall Calendar is now on sale! As promised, this year’s calendar is now on sale in the Gruesome Goodies Store. This is the special 40th Anniversary edition that looks back on the history of the series then looks forward to the new mayhem to come. Each year’s calendar sells out quickly so don’t wait to order yours – why not order it today? The Monster Scenes 40th Anniversary Calendar is here! What better way to start this anniversary year than with an all-new wall calendar? If you’ve been following Monster Scenes closely, you’ll know we began publishing our calendars back in 2006, the year of the series’ 35th Anniversary. Now, here’s a new calendar to add frightful flair to your wall all year long, commemorating 40 years of Monster Scenes! This year’s calendar is quite unique in that it follows the chronology of Monster Scenes. We’ve dug through our Monster Scenes archives to bring you 12 months of information, fun facts, and rare images. Plus, we’re pleased to include some additional material from the collection of Andrew P. Yanchus, original Aurora R&D team member from 1965 – 1975. If you missed any of our previous calendars, don’t miss this one. Each year’s edition sells out so don’t be left empty-handed on this very special anniversary year. Watch the “Gruesome Goodies Store” for the order link – it’s coming in just another day or two. You are currently browsing the Monster Scenes Official Blog blog archives for January, 2011.